The chart below says it all. If investors want the stock markets to go up, the denominated currency has to fall. The chart shows four lines. The red line is the Japanese Yen and the blue line is the Nikkei 225. 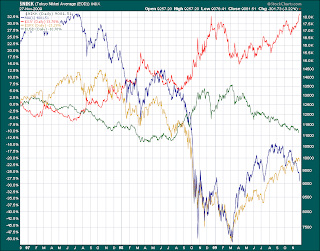 The green line is the US dollar and the gold line is the S&P 500. It's not just a US phenomena. Stock markets are driven by their currency either appreciating or depreciating with their correspondent markets moving in the opposite direction. Maybe this is true of debtor nations and the US and Japan are two of those members. The point is the 'markets' are a farce. They do not represent value or even a market. They are simply reactions to currency. Why is currency the lone driving force? Well, let's be honest. the world economy is a 1974 Chevy Vega sitting on a hydraulic lift in a mechanic's bay. The mechanic has the manual in his hand and a puzzled look on his face. The owner is depressed and apprehensive. Yes, I know. The government says the 'recovery' is here and the recession is over. Funny, 1 in 8 Americans receive food stamps, 1 in 4 mortgage holders are under water, over 1 in 10 mortgage holders is in either in foreclosure, delinquency, or default, 2 in 10 are without gainful employment, and more than 50% of our local (in my county) public school children qualify for lunch assistance (euphemism for poverty). Is it even possible to use the word 'recovery' with respect to the real world? Only our government can espouse such blarney. The rest of us know better. Anyway, our new leader, the Federal Reserve, had to engineer a stock market rally to help their banking brothers weather the storm of the century in derivative losses. They also engineered the 'happy news' that went with the 'recovery' news but I think we all know there has been, and still isn't, any good reason to buy stocks since March of '09. Yet, markets rally and investors have for the most part participated. Some blindly. Some stupidly. Some ignorantly. Some because they knew the Fed had a printing press and a hankerin' for a bubblicious rally. Most investors never knew anything about anything anyway so they never saw a bus coming straight at them. In fact, most investors never even knew they were in the street. And still, they don't know that the central bank rescued them from financial peril. Thus, the 'market' is no longer driven by 'investing'. 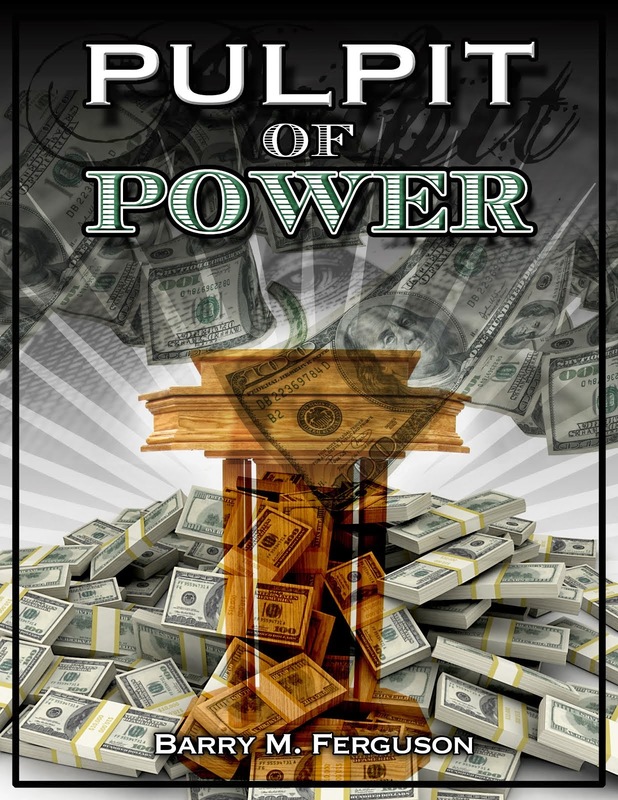 It is now a function of money from the central banks and their conspirator sister banks. Further, the markets are a function of inflation instigated by the printing of said money. Sort of. In truth, there has been very little printing. Money is mostly created these days by the electronic methods that essentially create credits on balance sheets of the Fed's friends. The TARP money was given to AIG to give to Goldman Sachs to wash away derivative losses, for instance. Credits work the same as real money only better. They don't leave as much of a trail and the stupid people never even know the deed happened. For instance, where did the 'toxic illiquid assets' that were 'gumming up the financial system' according to then Treasury Secretary Paulson go? Anyway, I'm sure Nancy Pelosi knows and she is watching out for us. Credit is easy and interest rates are zero. That combination produces waste and excess. Dubai is the latest contestant to not find a chair when the music stopped in the silly game of economic musical chairs. They have been busy over the past few years building buildings to the moon of which no one rents. On November 27, 2009, one of their sovereign funds was left a little short in a bond repayment. Something like $60 billion if you are counting. This little announcement worked to tank the markets for the day but it was noteworthy that the indices all climbed back almost from the opening minutes. No doubt, plunge protection teams all over the world immediately jumped into action. The shock was of course that everyone thought that Dubai was a bottomless well of wealth. Nope. Broke like every other country. Their economy, like ours, is an illusion of wealth. Without government 'stimulus' and subsidy, it all vanishes. But don't be misled. $60 billion is peanuts. Government printing press machines can cover that note in the blink of an eye. Read further. I saw a news article that said that credit default swap spreads on the debt were widening. Ah, derivatives. I knew they were in there somewhere. $60 billion in notes were real. That's the money borrowed to build the buildings and projects for the illusion of a vibrant economy. If you're interested, Dubai has an unemployment rate of 20% as issued by their government. Anyway, those projects under construction were no doubt leveraged up with derivatives and backed by credit default swaps and insured by some insurance company that didn't have one billion much less sixty. And no doubt, no one knew who held any of the insurance or swaps or derivatives. And no doubt, the real dollar figure at risk was many times $60 billion. Of course, the media isn't going to catch on to that little tidbit. Otherwise, the chart below wouldn't make any sense. Specifically, when the news broke of the possible default, investors ran to the dollar to minimize risk. The dollar went up. The stock market went down. The music had stopped for the Dubai fund. The music will start again on Monday morning. The game will continue. The dollar will resume its slide. The markets will go back up. This gets boring. This is our 'market'. Want to play? Then understand the new rules! Ring, ring, ring - It's Asia Calling! I have introduced my readers to the new chart formation (that I invented) called 'The Chinese Phone Call'. I would like to change the name to the 'Asian Phone Call'. Do I hear a 'Yea'? Here's the deal. The stock market in the US is now a slave to the 10-year US Treasury yield. When it gets to 3.5%, the Asians, primarily the Chinese and Japanese, pick up the phone and call our Federal Reserve or Treasury Department for help. Japan and China own trillions of this garbage spit forth by the Treasury's perpetual printing machine to satisfy an economy that used to hinge on manufacturing but now just debt. It should also be apparent to everyone that the US economy cannot tolerate higher interest rates imposed by higher bond yields at this point in the 'recovery' (I'm using that term a loosely as does our government). If US bonds have to be bought, they have to be bought with US dollars. Take a look at the chart below and see if you can spot a massive volume spike in the UUP. 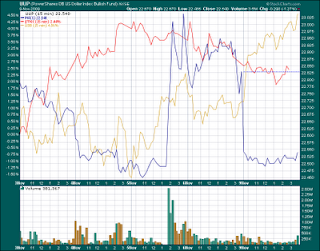 The UUP is of course, an ETF that correlates to a rising US dollar versus other currencies. It is the blue line and the 10-year Treasury yield is the red line. The gold line is US Bancorp and I included it so we can see how some bank stocks can be helped by a lowering of the Treasury yields. What can we learn from this relationship? 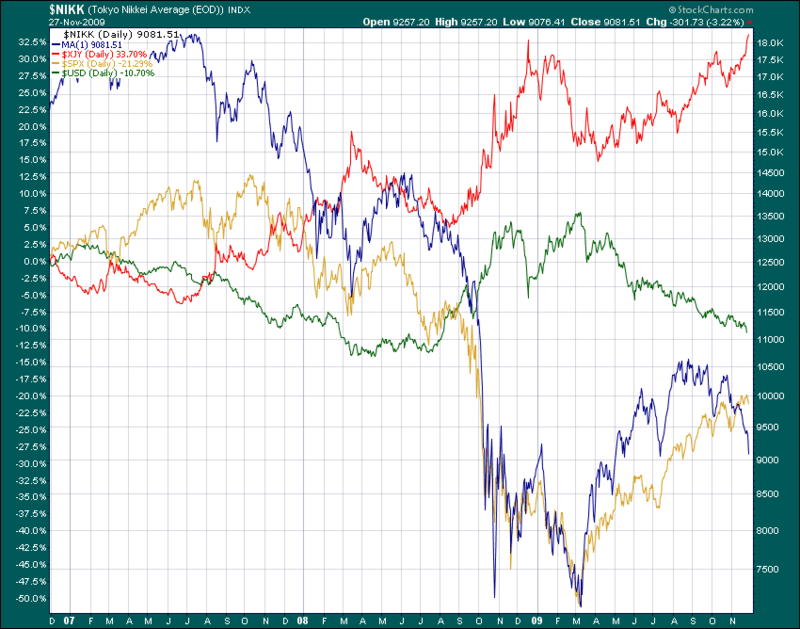 First, the US dollar is not in 'free fall' but it is slowly declining relative to other currencies. Perversely, the demand for dollars to buy bonds to dampen rising interest rates spiked by constant debt issuance has muted what could be a worse decline. Two, the massive US debt will likely continue the dollar demand for the foreseeable future. Three, while it looks like the Dow has been rising in dollar terms, the past few months would show a different picture in other currency denomination. It would be far less impressive. Fourth, the dollar has lost some 15% or so against other currencies this year. Why would anyone by the US bond for a 3.5% yield and risk a 15% principal loss? Does that sound wise? Lastly, this is the foundation of the current market. Wise investors have been warned that this is unsustainable. Sooner or later, somebody is going to run out of money or tolerance for debt.